Kels on the Ion Audio iED01 drum kit, 26 January 2008. A couple of weekends ago, we dropped off a bunch of stuff at the local Goodwill. I decided to go in and look around, never having been in a Goodwill myself. I resisted a hell of a lot of temptation in the book section, but did walk out with a hardcover copy of Cliff Stoll’s The Cuckoo’s Egg for $1.49. On the way out, I noticed a largish box among some more-expensive items by the front counter: an Ion Audio iED01 electronic drum kit. 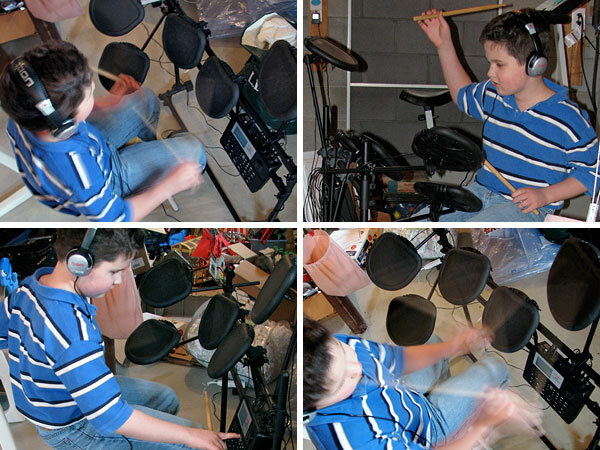 Five velocity-sensitive pads, two pedals, a sound/sequencing module, headphones (no speakers! just headphones! ), a metal frame, and even a pair of drumsticks. I thought I might have seen this kit elsewhere, but I wasn’t sure. I hadn’t heard of Ion Audio. And it was labeled $75 AS IS, in a fairly beat-up box. So I left with just the book, but I figured I’d look up the drums on the Web once I got home. Well, I couldn’t put it out of my mind a little while later at Target, so I made a few calls and found someone with a web browser. (Thanks, Jayme! And curse Verizon for not being Apple’s partner, or I’d have been able to do all this myself at Goodwill with an iPhone.) The Amazon reviews suggested that it’s a decent practice drum kit for its usual street price of about $250. Professionals complain about its inadequacy for keeping up with serious practice with polyrhythms and such, and thus its questionable value for the price…but (a) you can’t get a pro-quality drum kit of any kind for less than $300, (b) this is, at least for now, just to have something to bang on, and (c) most compellingly, it’s $75. So I went back to Goodwill and asked if I could open up the box, which was pretty much held together with tape, and check that everything was included. Although there was no styrofoam or any other packing material, all the major parts were there, as far as I could tell without completely assembling it in the store. The manuals were included. It worked when I hooked up a pad to the sound module and plugged it in. A cashier came over and mentioned that they’d just gotten it from Target; it seems to have been a Christmas present, returned in unrestockable condition but pretty much unused. I paid for it, brought it home, and set it up. It works. It ain’t a pro drum kit, but it’s a hell of bargain. If I decide to add a couple of pads—and I might, since five pads only amount to a snare, a hi-hat, two toms, and a cymbal, whereas it would be a lot fuller with a second cymbal and one more tom—it’ll cost me less than $50 for a pair of new pads. And, surprisingly for an inexpensive consumer set, it has a MIDI output jack, which means I can hook it up to my computer if I want. My complete home studio is one step closer. And Kels, you might have noticed, kind of likes it. I love the pics of Kels. I downloaded the Disney picture with the two boys and captain hook recently. I need another one of them and a family photo would be AWESOME! Think of a reason to post it. Goodwill rocks. Electronics are usually a bum deal, so you got a gem. I like to go for the cool t-shirts for $1 or less. Sometimes I find some retro-beer glassware. I always enjoy playing the “Ugliest thing in the store” game too.